This cuddly flannel quilted blanket will sure to get lots of love from your baby girl. It also makes a wonderful gift! Blanket measures approximately 38x33 and is made of four premium flannel layers quilted to feel like chenille. 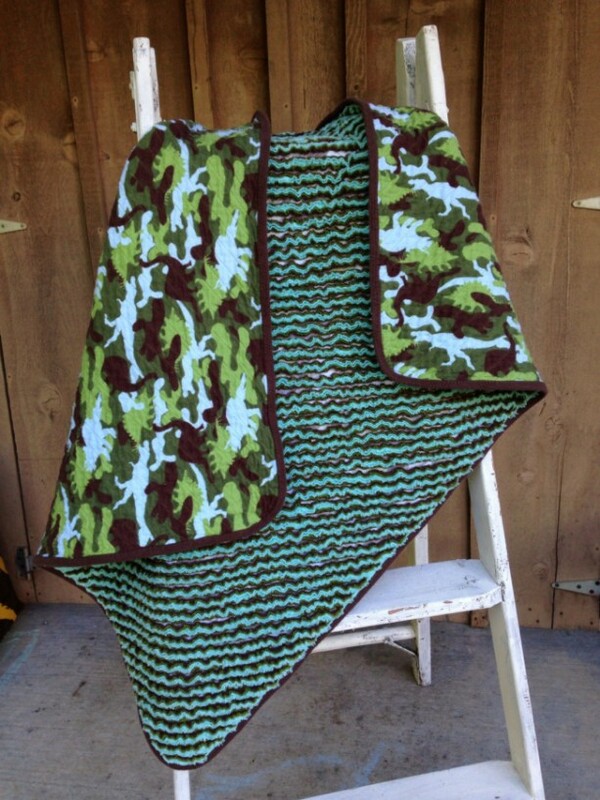 This item is pre-washed is is army green, light blue and brown Camouflage dinosaur print. Machine wash on cold and dry on medium heat. This blanket is warm without the weight. It's very flexible and would be great covering a carseat in winter. Are you interested in a gift set? I can make dino print items to match: - baby bibs - burp cloth - small chenille blanket - small lovie blanket lined in silk - maple crinkle teething ring Convo me for more information.